The first thing you notice when you pick up the box for Aoshima's latest version of Mazinkaiser is its weight. Opening the box and you're rewarded by one hefty robot toy. Here's the vital statistics - height 8.5 inches, wing span 14.5 inches, weight 1.9 pounds. It all adds up to an admirable amount of die-cast, plastic reserved for joints, head, hand and Scrander. 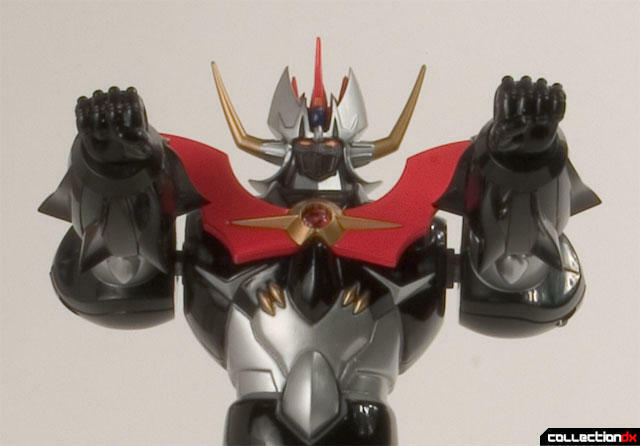 Packed in the box with Mazinkaiser are a variety of hands, a shiny Kaiser Blade, missiles and most obvious of all the vast black wings of Mazinkaiser's Scrander. Being a fan of robots with wings and swords, the natural choice was to put the Scrander straight on his back. The first thing you'll learn when assembling the Scrander? Those wings aren't just big, they're also pretty sharp - some care is required to avoid impaling your hands. 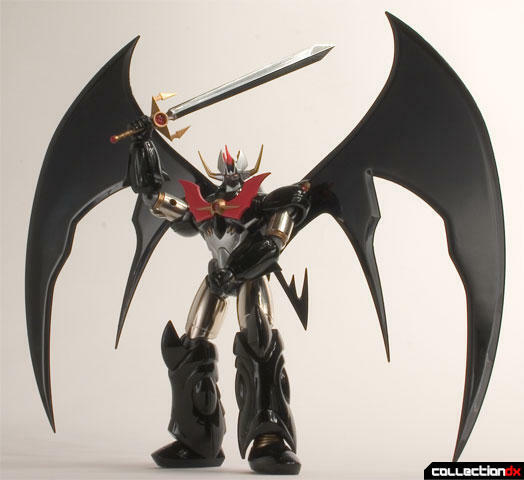 But Scrander in place, Kaiser Blade in hand the winged Mazinkaiser has real presence on any display shelf. 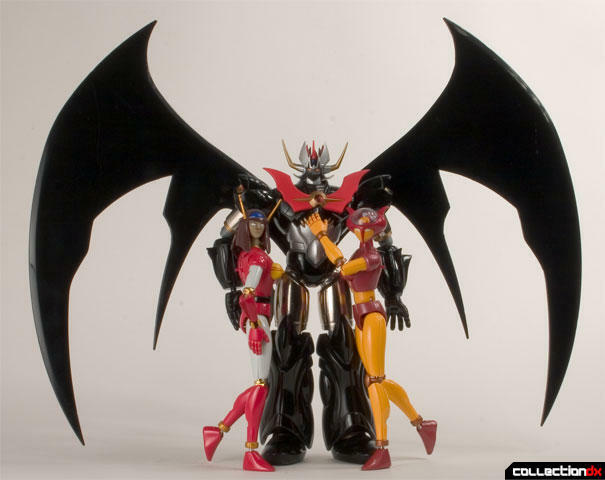 There's more to Mazinkaiser than just standing around, posing with a sword. Remove a small panel from his stomach and you reveal a discreet missile launcher. Load one of the two missiles from the box, flick a switch on his back and launch the Giganto Missile across the room (with a missile less than half an inch in length the name Giganto seems a little out of place). 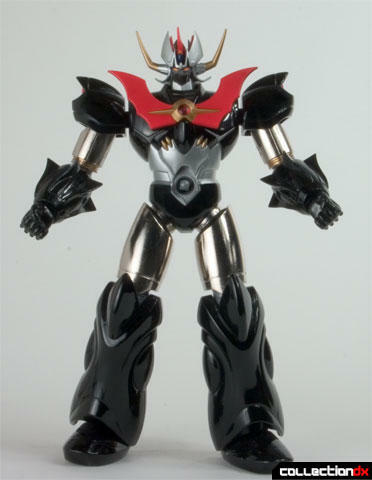 Switch his metal arms for a second set of plastic ones and Mazinkaiser gains his Turbo Smash Punch. Operation is simple, push back the forearms and wind them as tight as they'll go. The punch is released by pushing a shoulder button, but what follows is wholly disappointing - the forearms spin off and drop to the ground a matter of inches in front of Mazinkasier's feet. Hardly turbo and never likely to smash even the polystyrene packaging in the box - it seemed like a nice idea, but unfortunately the execution lets it down. The gimmicks and accessories are nice to have, but never really live up to hopes, stronger springs are needed to make them worthwhile. Anyone who loves die-cast in their toys is not going to be disappointed, with metal legs, arms and chest Aoshima have not been stingy. Joints are strong and offer a reasonable degree of pose-ability, certainly enough for Mazinkaiser to adopt a striking stance. 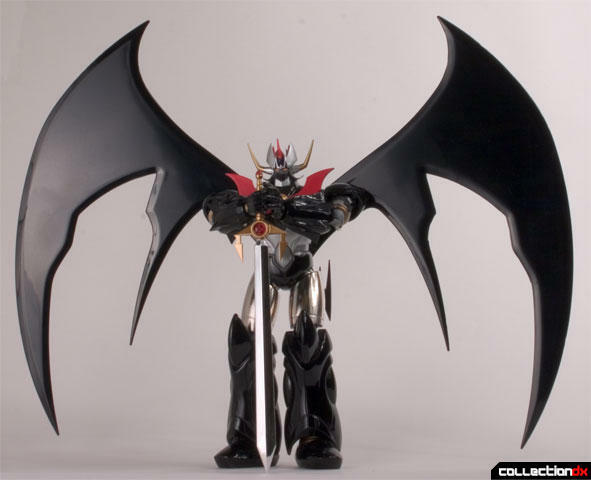 For me it's the combination of that solid metal weight, those sharp black wings and a long shiny sword that make Aoshima's Mazinkaiser a must have. 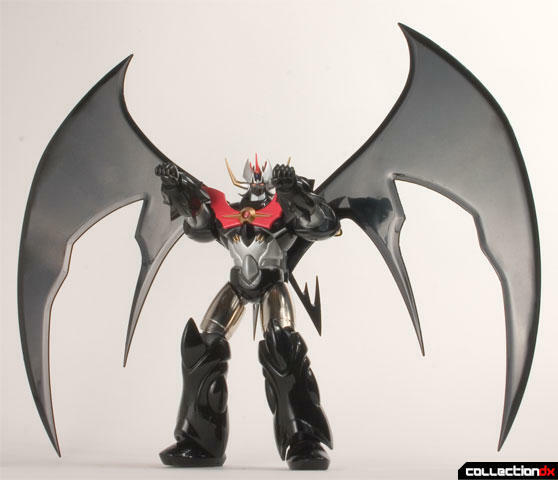 This review refers to the Japan version of the Black Wing Mazinkaiser. Aoshima also released an Overseas version with blue leg and forearm armour and without the Japan version's chrome shine on the sword. Both retail for around 13,000 Yen.